Here are some top stories in cosmology, physics and evolutionary biology from the past couple of weeks. 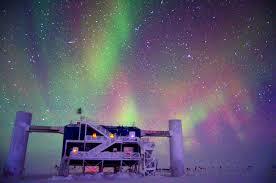 Astronomers Detect Neutrinos From Outside the Solar System. This follows from the earlier post on the IceCube Project. From the Verge: Astronomers Astronomers in Antarctica are kicking off a new way of studying the cosmos. Rather than studying light, researchers now plan to study neutrinos from outside of our solar system. These hard-to-detect particles can carry new information on distant galaxies. Unlike light, neutrinos can pass through most all matter in their path, allowing researchers to see exactly where they came from and to learn more about black holes, supernovas, and other cosmic occurrences. Though neutrinos have been known about for some time, and were detected in one isolated experiment in 1987, researchers have since only able to detect ones from within our own solar system. In an article published today in Science, researchers from the IceCube Neutrino Observatory in the South Pole detail the detection of 28 of them, which they say must have originated farther out in the cosmos. Eight Interesting Facts About Human Evolution. From IO9: Some interesting evolutionary facts include: (1) Early humans left Africa over 1 million years ago; (2) Humans have very low genetic diversity compared to other species; (3) You may have Neanderthal DNA; (4) The human population crashed 80,000 years ago; (5) Humans crossed the Indian Ocean 50,000 years ago; (6) Homo sapiens had a culture for less than 50,000 years; (7) Homo sapiens have always used fire as a tool; and (8) Homo sapiens are still evolving rapidly. Dogs Originated in Europe, Not East Asia? From the Economist: Foxes can be tamed deliberately, by selective breeding (see article). But this probably recapitulates a process that happened accidentally, many millennia ago, to wolves. The product of that was the animal now known as the dog. But where on Earth this happened is moot. Fossils have been used to make the claim for places as diverse as Russia and the Middle East. Genetic evidence has pointed towards East Asia, with some people believing that New Guinea singing dogs and their Australian offshoots, dingoes, are largely unchanged descendants of the first pooches. Olaf Thalmann of the University of Turku, in Finland, Robert Wayne of the University of California, Los Angeles, and their colleagues beg to differ. They think Fido was born in Europe, and that they have the DNA to prove it. Secrets of Mars’ Birth Revealed From Unique Meteorite? From Science Daily: Florida State University scientist has uncovered what may be the first recognized example of ancient Martian crust. The work of Munir Humayun — a professor in FSU’s Department of Earth, Ocean and Atmospheric Science and a researcher at the National High Magnetic Field Laboratory (MagLab) — is based on an analysis of a 4.4 billion-year-old Martian meteorite that was unearthed by Bedouin tribesmen in the Sahara desert. The rock (NWA 7533) may be the first recognized sample of ancient Martian crust and holds a wealth of information about the origin and age of the Red Planet’s crust. Humayun’s groundbreaking discoveries about the crust and what it reveals about the Red Planet’s origins will be published in the journal Nature. This entry was posted in Uncategorized and tagged evolution, evolution of dogs, first Americans, homo sapiens, IceCub Project, Mars, neutrinos, origens. Bookmark the permalink.